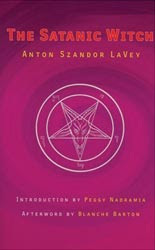 The late Anton Szandor LaVey, founder of the Church of Satan, may be the most notoriously familiar for his Satanic Bible, but The Satanic Witch best reflects the discoveries Anton made in his younger days working the carny shows and Mitt Camps. This is undiluted Gypsy lore regarding the forbidden knowledge of seduction and manipulation. The Satanic Witch is not designed for Barbie Dolls, but women cunning and crafty enough to employ the workable formulas within, which instantly surpass the entire catalogue of self-help tomes and New Age idiocies. The Introduction — Peggy Nadramia, High Priestess of the Church of Satan, tells us how this book changed her life. The Afterword — Blanche Barton, Anton LaVey’s biographer, Chairmistress of the Council of Nine, and mother of Satan Xerxes Carnacki LaVey, Anton’s third child, informs us how The Satanic Witch came to pass and influence the behavior of so many women.